I am unconditionally and irrevocably in love with coffee. There is no other way to truly express my relationship with this sweetly caffeinated elixir. A few days ago I inadvertently stopped drinking coffee. How? I haven't the faintest idea. But I went an entire day without a single drop of coffee. I didn't think much of it. The next day came and so continued my lack of caffeine intake? Hmm...maybe I could actually do this? I thought to myself. Could I, Tommy Engstrom, actually stop drinking coffee? So, I gave it a try, it had to work. I mean, it's not that I am that addicted to caffeine. Ha. Who was I kidding? By noon, the migraine from caffeine-withdrawal had hit full-force. It was awful, yet I refused. I would not drink coffee. I could do this. Nope...my head felt as though a thousand nails were being hammered into my skull. If you are not yet addicted to caffeine take note: The headaches you will have as a result of caffeine withdrawal are some of the worst you will ever experience. Perhaps it's better to never start drinking coffee. LIES - I am saying this to tell you what the 'right thing to do' is, but I know I myself would never follow such advice. My caffeine free stint only lasted two days. Two days of some of the most painful headaches that I have ever experience. It. Is. Not. Worth. It. Just say YES! When my mother and I fell upon this recipe, it was a no-brainer! This recipe would for sure become one of my all-time favorites. And guess what, I was right! This recipe definitely classifies as a dessert. It is sweet. And delicious. And caffeinated. All things good. I implore you to make this Viennese Iced Coffee today. Seriously, it is not difficult and you will be forever changed! Do it! Until next time...happy eating! Or should I say caffeine drinking!? 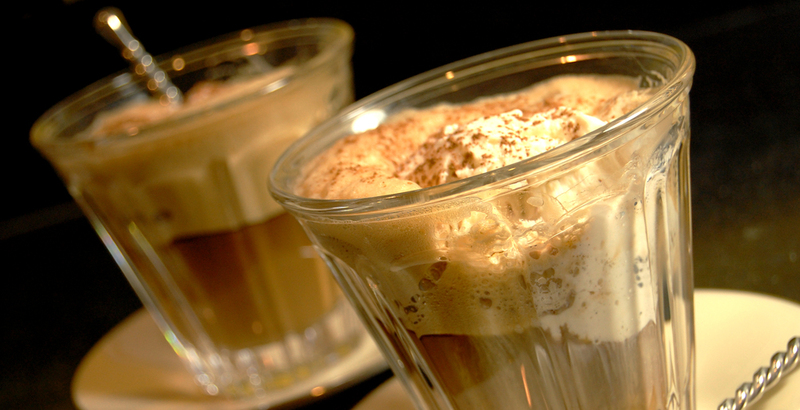 Combine the espresso, sugar, vanilla, and hot water in a blender and stir until the sugar dissolves. Put the ice in the blender and process on high until the mixture is almost completely smooth. Divide the mixture between 4 short glasses. Place the ice cream in a microwave on high for 15 seconds, until softened. Scoop one ball of ice cream into each glass. With a small sifter, sprinkle each drink lightly with cocoa powder. Serve with a short straw and a teaspoon.